The Washington Post was designed around 1910 for street lighting in our nation's capital. Today you will find the classic double fluted base and tapered shaft have become a standard American design. 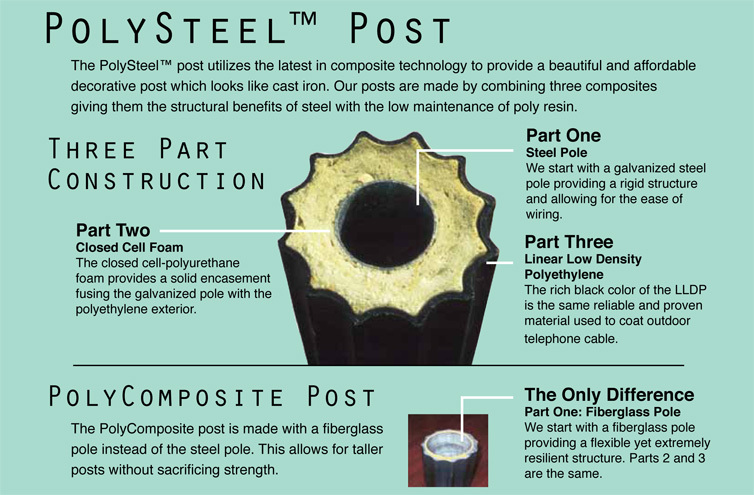 Polysteel Light Poles are a unique three part composite combining the structural benefits of steel with the low maintenance and moldability of industrial plastics. The combination provides for a beautiful high performance street light pole with the added convenience of low maintenance cost. 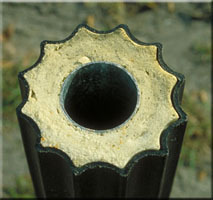 This unique polysteel street light pole design is composed of a linear low density polyethylene (LLDPE) exterior combined with a structural polyurethane closed cell foam cast around a galvanized steel post. The LLDPE is the same reliable and proven material used to coat outdoor telephone cable. The durable Polyethylene outer sleeve made with up to 100% recycled material. 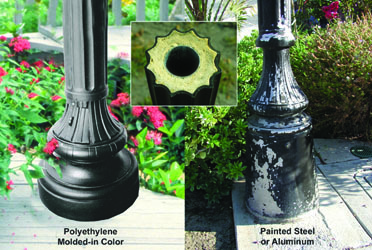 Virtually indestructible, the street light poles housing is architectural grade rotationally molded designer polymer resin, UV protected from sun light with molded through color which will not rust, peel or chip. The Polysteel Commercial Street Lights are available with our unique direct burial base. The installation of this base is easy and can be completely installed in less than one hour. To install the light post a hole must be dug as shown in the illustration below. The conductors are run through the post and the luminaires is installed on the post tenon. The post is then set into the hole and one or two bags of premixed concrete and water are added. The concrete can be mixed in the hole. The remaining soil can then be placed on top of the concrete as the post is leveled. Please contact us for detailed specifications and installation instructions. Numerous lamp options are available to accommodate your specification requirements. A leader in decorative antique style lamp posts, Classic Lighting has delivered the finest quality street light products and excellent customer service for over 40 years. 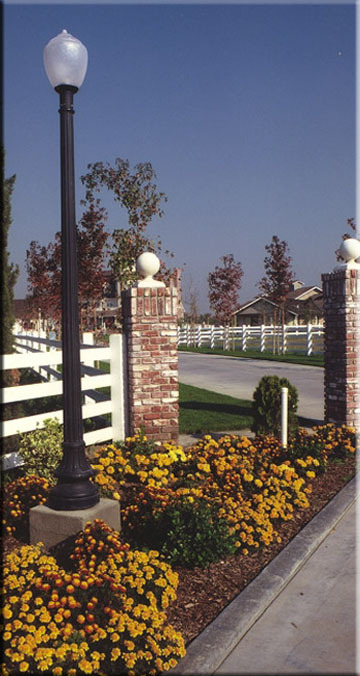 Approved by numerous Department of Transportation's/DOT for Public streets, highways, roads; planned communities, HOA's, marinas, docks, wharfs, amusement parks, gated communities and hospitality venues have all specified Armeria's Classic Street Lamps. Along with installations for parking lots, outdoor area lighting, end of driveway lighting and many other outdoor pathway lighting requirements. 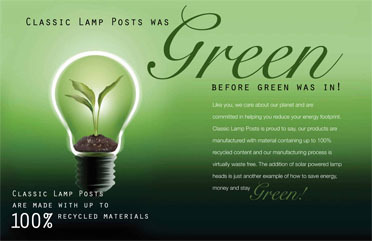 Polysteel street lights are manufactured in America ensuring prompt delivery and good quality. Classic Lighting has a very loyal following with light poles installed in the most inclement of weather over 30 years ago. They have never been painted in all those 30 years. Scott Hamilton is just one of many satisfied customers. Please review manufactures limited warranty for details. To compliment our Washington and New England light post series, Classic offers lighted bollards, wall mounted light fixtures, pier mounted light fixtures and mail boxes. .